Fig. 120 Marginal revenue product. The marginal revenue product, together with the MARGINAL FACTOR COST, indicate to a firm how many factor inputs to employ in order to maximize its profits. This can be illustrated by reference to the utilization of the labour input under PERFECT COMPETITION market conditions. In a competitive LABOUR MARKET, the equilibrium WAGE RATE and numbers employed (We and Qe *, respectively, in Fig. 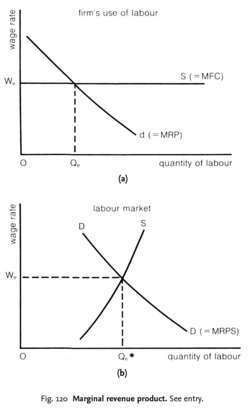 120) are determined by the intersection of the market demand and supply curves for labour. Because each firm employs only a small fraction of the total labour force, it is unable to influence the wage rate. Thus, the wage rate, and hence the marginal cost of labour (MFC), are constant to the firm -each extra worker adds exactly his wage rate to the firm's total factor cost (see Fig. 120 (a) ). The firm's MRP declines because although under competitive conditions the product price remains constant, the marginal physical product falls because of DIMINISHING RETURNS to the labour input. The firm will maximize its profits by employing additional workers up to the point (Qe in Fig. 120 (a)), where the last worker's contribution to revenue (MRP) is equal to the going wage rate (MFC). O] = capital's marginal revenue product in constant prices, and P[. In either case, most attempts at explaining this phenomenon begins with some type of estimation of the athlete's marginal revenue product (MRP). Equation (1) equates the marginal revenue product of a private sector worker to the private sector's real demand wage [([v.
Mathematical Expression Omitted]) is the marginal revenue product of factors. Colleges are effectively monopsony employers so players will not be paid their marginal revenue product. The concept of the marginal revenue product (MRP) is frequently focused upon in chapters on factor input markets of microeconomic textbooks. Persistence of such a wage dispersion in equilibrium may be explained by heterogeneous firm marginal revenue product schedules, see Reinganum . Why do labor contracts offer guaranteed annual wage increments? The conventional treatment of this subject shows that the demand curve for a factor in a competitive input market is given by the portion of its marginal revenue product MRP curve on or below its average revenue product curve. The key consideration is the behavior of marginal revenue product, which depends on both the extra output that an additional unit of an input produces and on the revenue that the extra output fetches. It shows that when a rate-of-return regulated monopolist moves from linear to nonlinear prices, the A-J input bias will decrease (increase) if the move increases (decreases) the marginal revenue product of capital. L] shows the marginal revenue product minus the marginal transportation cost of output. Second, in each case under affirmative action, white marginal revenue product (MRP) is higher in services than manufacturing, while black marginal revenue product is higher in manufacturing than services.